If you want to be successful at selling your product or service, you need to create and capitalize on every opportunity that comes your way. As a business owner, your company’s success depends upon your ability to convert interested prospects into sales. You can have the best product in the world, but if potential consumers have never heard of it, it’s worthless. The days of “if you build it they will come” business models are over. If you want to compete in a modern market, you’ll have to hustle for results. Don’t wait around while your sales numbers dwindle. Every year, billions of dollars are spent by companies seeking the best ways to contact potential customers. This is particularly relevant in the B2B market, where getting in touch with the right clients has huge payoffs. If you’re not doing everything in your power to get as many sales leads as possible, you’re already losing. This guide will give you an in-depth look at lead generation and B2B sales leads. The aim of this guide is to help provide you with a better understanding of the role lead generation plays inside a successful business. You’ll also find information on using a lead generation company and how to optimize your lead gen efforts. An entire research-based industry has formed just to help companies like yours buy business opportunity leads for sale at extremely affordable prices. The current sales lead market not only revolves around research companies and organic b2b lead generation, but also new developing technologies, which have a vital role in the future of sales prospecting. In recent years, a huge emphasis has been placed on developing various software products to help you find impactful business leads. It’s now time to take full advantage of the changing world of online lead generation. Let’s start with the basics - the sales lead definition. A sales lead is a prospective customer you already have information about. If you’re a current business owner, you probably encounter several sales leads every day. For example, if someone calls regarding one of your services but does not make a purchase, you most likely have their information available to follow up with them at a later date. Most business opportunity leads come in the form of inquiries, referrals, and other forms of contact with prospective customers or clients. A sales lead may also come through various lead generation services – but we’ll talk more about that later. Sales leads are the lifeblood of your business. You build a product or service, then try to attract as many interested clients as possible. From there, your success is based on your ability to convert these sales leads into sales – commonly known as conversions. If you want to make conversions, you have to have business leads. Your marketing approach, social media platforms, cold calls, and other forms of customer interaction are all forms of attaining sales leads. It's a simple fact: When you put in more effort to find high-quality sales leads, you make more sales. Do you want your business to increase its sales quickly? If so, you have to obtain sales leads. This process is called “lead generation”. Lead generation is simple: It’s the process of obtaining sales leads for your business. Generation methods vary depending on what type of business you run. Your lead source can come from a variety of different avenues. As mentioned previously, you probably already generate leads on a daily basis through lead sources such as inquiries, marketing, prospecting, and networking. In the past, b2b lead generation would typically happen through traditional forms of advertisement, as well other organic interactions with potential B2B clients. Referrals are a significant component of organic lead generation. Recent advancements have made b2b lead generation more complex. Data analytics and other forms of technology have helped businesses target potential clients with more effectiveness and accuracy than ever before. While this may be intimidating, it’s also a new opportunity for your business. You can buy thousands of business opportunity leads for sale from various companies who provide lists of prospective customers to their clients. Some of these services are subscription services, while others are “pay per lead”. When you buy leads, you are effectively having a third-party generate the leads for you so you don’t have to generate the leads yourself. Online lead generation software has become a vital component of competing in the world of modern commerce. Being a successful B2B company means you have to generate a lot of business leads and convert those leads efficiently. The key to this is pinpointing the best companies to sell your products to. B2B sales is the process of selling products or services to other businesses, rather than individual consumers. The reason that the process has its own subject area is that it requires an entirely different approach. You might be wondering: What’s so different about business to business sales? The answer is simple - it’s more difficult to sell directly to businesses. First, in comparison to everyday consumers, there are far fewer businesses. Secondly, most business to business sales come in the form of large contracts or expensive software or materials. This means that business executives are much more pragmatic about the purchases they make. They’re more likely to consult with competition and make purchasing judgments over an extended, research intensive period of time. While selling to businesses is difficult it is also extremely rewarding. If you want to make big money, selling your products to businesses is probably your best option! Forming long-term relationships with large businesses can guarantee years of income for your firm. You should never underestimate your firm’s individual relationships with clients – as businesses grow, so will their need for your products. The earlier you get in, the more you’ll make. As a B2B sales company, you’re probably aware of how hard it can be to find clients. You must be able to prove that you can provide meaningful, long-term value to the firm you are attempting to sell to. As with any form of commerce, an increasingly globalized world has opened business to business salesup to a larger, international market. While this provides additional opportunities, it also makes it harder to convert sales. Don’t let this deter you. Companies that are succeeding in today’s market are the most forward thinking businesses. Your sales team should constantly be aware of new developments in the B2B sales lead industry. Not understanding your market can lead to dramatic losses in market share. Sales prospecting is not to be taken lightly. One of the more specific differences between B2B sales and general sales is the methods of marketing that are most effective. Believe us when we say you need an entirely different approach to B2B marketing. Unlike traditional sales, guerilla marketing doesn’t work effectively in business to business sales. Other firms are unlikely to make purchases based on simple internet advertisements. Their leadership teams don’t just decide to purchase products after seeing a catchy Twitter or Facebook ad. If you were running a business, would you buy your entire company’s stock of computers just because you saw a Dell commercial? B2B sales are a lot more customer relations intensive. As a company doing lead generation marketing, you will want to approach businesses that you feel could derive benefit from your product or service. The fact of the matter is that competitors in any industry are already contacting companies and pitching their products or services. You need to be able to find b2b leads quickly and effectively in order to help you get your foot in the door before someone else builds a relationship and makes a sale. If you don’t act fast, you won’t sell, period. In addition, you’ll want to be able to clearly and effectively communicate how your service is superior in providing their firm with the most value. Smart businesses don’t respond to hype or trends – they make decisions based off of what’s best for their bottom line alone. The best businesses aren’t emotional. They have one goal only: to make money. All B2B marketing tactics, strategies and techniques should have a multi-faceted approach. Regardless of the industry you’re in, it’s important to utilize as many lead generation ideas and resources as possible that will bring you in contact with potential clients. Why Are Leads So Vital? We’ve already discussed why leads are such an integral part of your business’s success. Still, there are many concrete examples of why leads are so vital to your company’s viability. For example, in some cases, up to 50% of companies purchase goods from the vendor that first comes into contact with them. This means that getting in early could be the key to your success. In addition, finding solid leads and nurturing them over time can increase your sales conversions by up to 20%. These may not seem like large numbers, but marginal increases in your sales figures can have drastic consequences for your profit. Think about how much more money your business would make if it increased its current sales figures by 20%. In addition, an increase in sales can help you establish yourself in your industry – which in turn creates more future sales for your business as well. The quality of leads is not the only important factor in lead generation. The quantity of leads you generate is quite significant too. The more you have, the more sales you can make. Simply put, it’s “a numbers game”. It’s simple: if you have more leads, you have more chances to convert those leads. Just think about it, as a business owner, would you want 100 potential customers or 10? Statistically speaking you have a much better chance of getting a sale out of 100 prospective customers, then just 10. Regardless of which lead source you generate your leads from, whether it is organically or by purchasing them, the more you have, the more money you will make. One of the most important factors in choosing your approach to sales leads is your industry. This also includes the cost of the products or services that you provide to your customers. Let’s be honest, the cost of your company’s goods will impact who can buy your products. For example, if you provide high-end expensive software to firms, you will only approach established businesses with large technology needs. You should never waste time trying to create mass awareness surrounding a product that only a select few companies will be able to afford. Contacting companies who can’t afford your products is a waste of your time and money. You’ll want to find your niche and approach it intensely. On the other hand, if you provide staplers to office buildings – you’ll want to aggressively approach thousands of offices around the country. Your b2b lead generation should consist of finding every company in need of staplers throughout the nation – regardless of size or budget. As for your industry specifically, different industries require different lead generation and nurturing. Some firms will be able to generate leads more organically, through referrals and word-of-mouth. Certain buyers may only want to buy goods from companies they know have an established reputation. 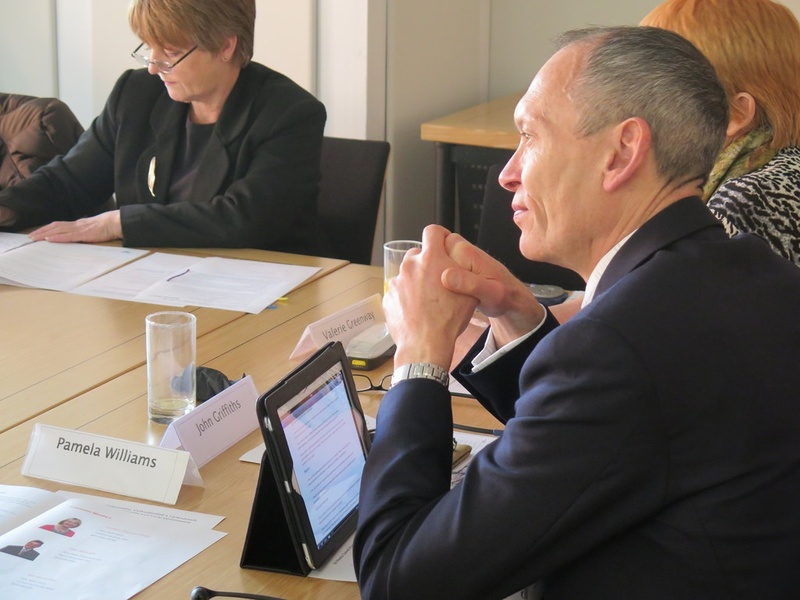 Others will have to search intensely for firms to sell to. Different companies have been helping modern firms enhance their lead generation and many of them are specific to certain industries or product types. You never want to waste time on a broken method. Figure out what works for your business and do more of that. The key to success in any business is finding out how you generate your sales leads. Although it may sound easy, it isn’t. Companies invest billions of dollars each year trying to come up with ways to better generate sales leads. The quicker you find an efficient solution, the more money you’ll make. There are various ways you can generate sales leads. In today’s current business environment, there are three primary ways companies develop these leads: organically, through lead generation companies, and through lead generation software. We will expand on each subject below – but first, it’s time to discuss ‘qualifying’ your leads. We’ve already gone over why it’s important to have as many leads as possible, this is often referred to as ‘quantifying leads’. Now it’s time to discuss qualifying leads, which is the process of ensuring that your leads are of as high as quality as possible. You don’t want to generate a bunch of irrelevant leads just for the sake of doing so. While it’s important for you to have as many leads as possible, you should still make sure they’re relevant to your business. You want to make sure that your leads are a good fit for you. If a lead won’t be able to afford your product or doesn’t need it, it isn’t a good lead. If you’re generating leads yourself, you will want to make sure that they are quality prospects . Luckily, most lead generation companies do this for you. They have infinite knowledge on the viability of each lead, and a good lead generation company will only provide you with leads that qualify for your business. We discussed this earlier, but it’s important we give you a full understanding of organic lead generation. Organic lead generation can come in a variety of forms. Normally, you will organically generate leads by making people aware of your firm and its services. Companies may then approach you to make inquiries. At this point, you have information on prospective companies and can begin the process of trying to sell them products or services. For example, you may attend an annual industry expo in which various companies come and view a variety of products within your niche. If you have a stand at this expo, you may take down some information from people who have inquired about your products. Each one of these companies is then a sales lead which you follow up on through your sales team. Other forms of organic generation are simply referrals from other clients or a company inquiring after seeing a traditional advertisement you have placed in a publication or online. You may even do intensive research within your firm to find companies that are viable clients. Contacting them through calls, emails, or other forms of communication is considered generating a sales lead. Although companies have focused purely on organic lead generation in the past, companies of the modern era have the benefit of various lead generators. So, what are lead generators? Lead generators are research companies that help firms find viable leads without having to do any legwork. They take the hassle out of finding qualified leads. Lead generation companies do extensive research into specific industries to help companies find perfect targets to approach. They have insight into industry wide information that helps them pinpoint niche firms operating in certain areas. Generation companies will compile lists of contact information and send you updated data on the best firms to contact for potential sales opportunities. Recently, effective lead generation software has also emerged. These lead generation tools don’t just help you find sales leads, they help you nurture them from start to finish. It has been monumental in revolutionizing the way companies approach relationships with their leads. HubSpot is the best rated all-in-one marketing & sales automation platform for the SMB market and is the only one with significant proof in being able to increase web traffic, leads and sales via their compelling growth stack. Through platforms like HubSpot, you are able to automate lead generation marketing and social media publishing, send constant updates to prospective clients, generate analytics, and track sales performances across your entire company. Lead generation software has changed the way companies approach both generating and nurturing leads. While it is not a necessity to enhance your sales conversions, most successful companies are already employing some form of lead generation software. Unfortunately, If you’re not using it, you’re already behind the curve. We highly suggest you check out some of the new software on the market, it can completely change how successful you are with sales. So, by now you may be wondering: should my company work with a sales lead generator? If you decide to employ a sales lead generation company to help you further enhance your current lead generation strategy, you’ll want to keep a few things in mind. First, you’ll want to know what you are trying to get out of your lead generation company. Do you want information on various leads in your industry? If so, you’re probably better off going with a traditional lead generation company. If you’re looking to revamp your entire lead generation strategy, you may also want to try consulting a sales lead generation software company. There are many recently emerging software products that can help you create an entirely new approach to managing your leads. We highly recommend you do substantial research before employing a lead generation company. There are many lead generation companies that act within specific niches or business types. You don’t want to go with a large provider because of their size. Chances are, there is a smaller provider that has experience generating leads in the space you operate in. Like any B2B transaction, consult a range of sources before making a decision. Below, we will outline some of the best sales lead generators currently offering their lead generation services to B2B firms. We will also provide you with the ins-and-outs of these industry leaders. Here at Fundz, we consider our web application and startup database one of the most innovative sources for B2B lead generation. That is because we focus on sales trigger events. Specifically, when a company issues a private placement, they usually are required to file a form called SEC Form D. Fundz captures the key information from these filings, adds more information on the company, then makes it super easy to search, export, save and see real-time updates on all the new filings from any device. The idea behind the approach is rather simple – newly funded companies have money to spend on various products or services. Firms that can cater to these newly funded companies will have the ability to form long-term sales relationships with them. Sales lead generation companies didn't have a strict focus on our realm – so we created Fundz. If you want access to newly funded businesses, we’re your one-stop-shop! We provide our users with constantly updated lists of newly funded companies within the United States. We want to make sure that none of our B2B clients miss out on any opportunities. Many current B2B companies monitor newly funded startups, but they only see the tip of the iceberg! Only a select few, newly funded companies make headlines or other mainstream databases. In fact, there are actually over 10,000 newly funded startups in the United States every year – and the vast majority of these companies are unknown to most B2B operators. Fundz is also one of the most cost effective solutions, with an incomparable ROI. We have a free version that provides basic access to some of our services, as well as an upgraded service for $10/user/month which offers unlimited access to our platforms. At just $120 a year/user, we are by far one of the most affordable ways to generate leads for sales teams. Simply put, we know how important leads are to your company and we want them to be affordable to access. 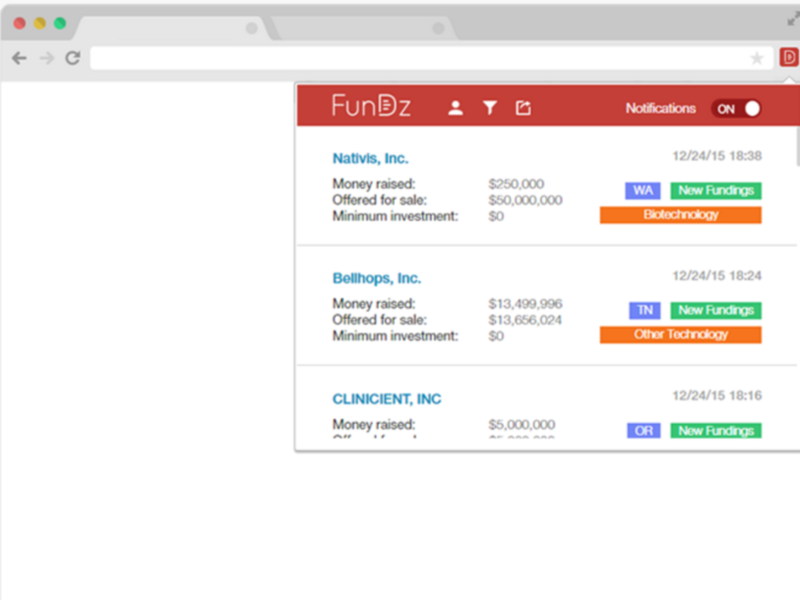 Fundz also provides real time updates, as well as a personalized chrome extension that merges seamlessly with your web browser. We’ve invested heavily into designing a fully functioning interface that allows you to see all the vital information you need on potential businesses through a single screen. You can also see valuable contact information so you can speak directly with the upper management of startups about prospective sales opportunities. What do you do after you generate leads? One thing is for sure, don’t make costly mistakes after you generate leads. You’d be surprised by how many firms don’t follow up after an initial email or calls to a potential customer. Generating a sales conversion often takes multiple points of contact before any real substance materializes. Just because someone doesn’t return your call or email, doesn’t mean they don’t have the potential to purchase a product or service from your company. The key to any sale is NEVER giving up. Show your leads you mean business by staying on top of your communication with them. Always follow up missed calls and keep detailed notes on communication. There’s another important thing we like to remind our readers of. Investing in sales leads NOW can have downstream benefits in the long run. For example, a lead that converts to a sale this month could result in a referral years from now. Never underestimate the power that your client network can bring you. It may seem expensive or time-consuming to generate leads at the moment, but the amount of business a B2B referral can generate can be astronomical. So, you’ve chosen a generation company and you’ve got your leads, but you’re still wondering if there’s anything else you can do to keep sales coming in. There are other more unorthodox ways you can help generate sales leads for your company. Companies often focus directly on convincing clients to purchase their goods or services. While this may work once you’ve already generated a lead, it doesn’t always help you generate them in the first place. Here are two secrets we like to tell our readers that many firms don’t use to generate organic sales leads. Many firms make the mistake of coming across too sales oriented. You may forget that in the B2B realm, other firms can smell companies that are disingenuous. Don’t be that company. If the only form of contact or advertising your firm engages in comes across as purely sales minded, this can have a negative effect on your business. In addition, promoting your company through non-sales focused marketing strategies can have a great impact on your ability to create organic leads. For example, press releases about topics in your industry, or about developments within your own company can have a great impact on your visibility within your niche. A lot of businesses generate leads online by making their voice loud and clear across the internet. Don’t use all your advertising strategies to create direct conversions – invest in your future market share. Trust us when we say buyers listen to authority figures more than anything else. Think about it, would you rather buy basketball shoes from Nike or brand you’ve never heard of? Chances are that you answered Nike, and that’s because Nike has established themselves as an authority in sportswear. Depending on the service or product you offer to your clients, one way to help increase your organic lead generation is to become create credibility within your industry. When businesses look to purchase goods from a company, they want to know the firm they are working with is both respected and knowledgeable. You should aim to publish materials, talk at conferences, and be quoted in articles about your industry. Creating valuable content in your field of expertise places authority in your company’s name. Become more than just a company – become a resource. Leads will generate themselves if you become the go-to source for information in your niche. Bottom line: the longer you wait to enhance your sales lead generation capabilities, the more money you will be losing out on. Tons of data shows that companies who pinpoint and foster more viable leads have more sales success both in the near and long term. You may have a world class product, but if you’re not generating enough sales leads, or nurturing them correctly, you won’t be able to sell it. There are countless firms that have leads for sale. While you may prefer to generate your leads organically, you should be willing to invest in third-party experts who will be able to provide you with a bit of a head start. We can’t stress this enough: buying high-quality leads for sale is one of the most worthwhile things you can do as a business owner. Generating leads doesn’t end with a call or an e-mail, so continue to foster relationships to better your reputation within your industry. If you take selling your product seriously, it will sell! Real-time alerts on hundreds of new startup fundings in the U.S. every week, export to CSV, best pricing anywhere.